Is Sous Vide "Real Cooking"? Admin: Split from the thread on sous vide recipes. Is anyone sick of this method, do we really need this type of cooking. I hate this method. If you can't cook, try, try again, and you're welcome for the helpful advice. If you think these fancy methods are going to make you a chef you are dead wrong. What is it that you hate? Frankly, I think the results are remarkable. I am not in the least bit tired of it. I think it will be around for a long time and will continue to bring out the best in many chefs. It doesn't replace traditional cooking, but it sure is a fine addition. Umm, ditto to the above again. Doc I love being a chef/cook/foodie! But this is fufu stuff! Don’t get me wrong I will sell this to my dinner guest, with that same passion. See, I have an industrial size sous vide production area in my kitchen. I also have a coffin size tumbler returm unit(water bath); I will send a picture on Monday. This is nothing but boil in a bag cooking! I know I have a way with word! "Fufu" it may be, but it makes for some pretty darn good "fufu". I will take it over many applications. I am not a chef and not speaking as such. Since when does something have to be difficult to be good? Seems like a matter of personal taste, just like all cooking. I've played with it a bunch at home where I do 5 course dinners for 12 on a regular basis. One advantage for me is that I can hold my entree meat perfectly until I get to that course, whip it out of the bag, give it a quick sear and I get rave reviews every time. The timing is not so crucial and makes for a more relaxing meal for me. For duck confit, the advantage is being able to use less fat and it takes up a lot less room in my fridge. So if you don't like it, don't do it! Doc, it's just my opinion. Don't take it personal, however sometimes we are just food geeks. 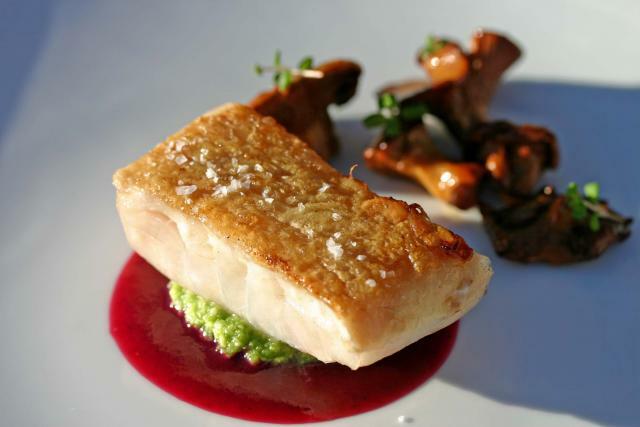 Sous vide is here to stay especially when it comes to banquet style events. It just makes the cooking and holding much better and consistent for all portions. While it isnt going to replace traditional cooking, it certainly will carve out its place. I think we are only on the tip of the iceberg so far. Sous vide could in the next 5 to 10 yrs make an entry into the domestic market for reheating food. It would just depend in a particular appliance becoming cheaper and more common. The combi-oven with selectable steam to heat ratio. So far only a few domestic models are out there like gaggenau but it does an amazing job with sous vide especially for fish. Speaking of shaking water baths, while you wouldnt use it for sous vide cooking, what it does do brilliantly is holding sauces for high speed plate assembly. Helped a caterer with a wedding last year, 75 people. All sauces were portioned out into impact resistant test tubes, capped and inserted into a shaker bath. It holds it at exact temp with no reduction or evaporation and the shaking seems to help anything from seperating. We cant have a defeatist attitude and say its just "FUFU". You just have to think outside the pot and figure out sensible applications. Talk to me in 10-15 years! I laughed the other day when I was getting a cup of coffee in my local Wawa (a convenience store, for you non-Pennsylvania folks) and I saw one of the workers dropping vacupacked food into a water bath. I thought, wow! Wawa's doing sous-vide!!! Actually Philadining, Wawa *IS* doing sous vide. So often in the food world, a technical term from another language tends to be attached only to the most refined execution or the art. If you are dipping vaccum packed food into hot water, whether it is with an attched thermocouple at Alinea or just slam dunking it at Wawa, it is sous vide. Of course the results are vastly different (no offense to chef G), but technically it is the same process albeit slightly refined. It kinda like that annoying trend last year when it seems everything was "A la Plancha".....jeeez! The scrambled eggs at Ruby's diner on route 66 are "a la Plancha". Thanks, Chef. I don't take it personally at all. Sous vide is in reality a simple basic technique, however, it is the subtleties that make it great, such as spicing the dish and finishing it. The only thing making it difficult right now is the relative hassle and expense of the equipment. The hassle factor is primarily in getting satisfactory equipment and finding the space to keep and use it. The bottom line though is that it works and works quite well. If places like Wawa put out an affordable and palatable product as a result of the technique so much the better. No that is what I’m talking about! Sometimes in covered or uncovered roasting pans, terra cotta pots, diluted marinades, and sauces (this makes GREAT brisket) or brines (also great Chicago style beef). I love it..........! In fact, it will be the first thing going I'm going to cook in my sous vide production area. I will let you know! I can see why it would seem like sous vide is merely a fad, but I suspect it's here to stay, simply because it is so versatile. From a purely pragmatic side, with a well-regulated water bath, it should allow an amazing level of consistency and repeatablility, no small concern in a commercial kitchen. But from the artistic side, it seems to me that it's just one of many techniques being employed in the larger culinary scene right now to explore the effects of slow-and-low cooking, as a contrast to all the searing and high-heat roasting. I've been fortunate to taste some pretty amazing sous vide cooking at StudioKitchen, which displayed super-concentrated flavors, and really unusual textures. And up at WD-50, I recently had a piece of Turbot that had an absolutely fascinating mouthfeel, not from sous vide but from extremely low-heat, gentle cooking in a pan. Traditional slow barbeque smoking seems to be pretty ubiquitous around here lately too, so I think low temps are just part of the current culinary zeitgeist. In the end it comes down to the talent of the chef, but from the tasting side, I can testify that a waterbath can be a tool for some major artistry, not just a hip thing that everybody's doing. The thing about sous-vide cooking that I enjoy is the texture of the finished product. Perfectly cooked protein. Also the vacuum packing allows the chef to practically inject the juices or any marinade they might wish to use deep into the protein so it retains juiciness and incredible flavor. I wouldn't want sous vide to become the only method by which fine food is prepared, but it definitely has its applications. Try asking for "bifstek con queso de Whiz a la plancha" and see where that gets you. Wear your running shoes. Sous vide is just part of the process in cooking. See example above. Here we have slow cooked black grouper (49 degrees C for thirty minutes) with a chicken skin crust crisped on a griddle and served with grape-chipotle sauce, smoked cashew and sea bean condiment, chanterelle mushrooms and young marjoram. Is that bifstek con queso de Whiz a la plancha con, or bifstek con queso de Whiz a la plancha sin? edited to add: Non-Philadelphians, see .sig. Thanks, Chef. I don't take it personally at all. Sous vide is in reality a simple basic technique, however, it is the subtleties that make it great, such as spicing the dish and finishing it. The only thing making it difficult right now is the relative hassle and expense of the equipment. A Ronco® Seal-a-Meal and a Crock-Pot cost how much? That's not an entirely fair point, though. While one can sous vide cook using just a stove, thermometer, and some plastic wrap, that's not exactly the best way to go about doing it. The same can be said for the Crock-Pot and a bargain vacuum saver. If you really want to do it right you're going to want to get a set up like nathanm, and that, undoubtedly, is a significant investment. Even striking a middle ground, say finding a decent water bath on eBay and getting a decent Tilia FoodSaver is going to be a few hundred dollars. This is a lot to most people, especially considering the fact that this method is pretty "untested" by most home cooks--you don't see Better Homes & Gardens publishing sous vide recipes every month. Even striking a middle ground, say finding a decent water bath on eBay and getting a decent Tilia FoodSaver is going to be a few hundred dollars. Making your own decent water bath is certainly not something that is too difficult. With a $40 PID controller and a $20 heater/stirrer, you can get yourself a reasonable water bath off of eBay that would support the use of an 8qt (maybe even 12 qt) pot. There's nothing fu-fu about sous vide unless you make it so. It is one of the most exciting new techniques I've seen in some 30 years of cooking and it is here to stay. Last week I updated an old favorite, "Salmon with Leek and Truffle" using sous vide. I made slits in the fish, inserted slices of fresh black truffle, added a dollop of duck confit fat, salt and sealed it in a pouch. I cooked it at 50 degrees centigrade in a bath for 20 minutes. Both the perfect texture of the fish and intense truffle flavor would have been impossible without sous vide. There's no going back. Just because a lot of people can cook something on a grill doesn't mean that there is not an art to doing it well. Sous vide is no different. And if it is and people can make good dishes without difficulty so much the better. The principle object is to eat (and cook) well. Any technique that helps accomplish those objectives is ok in my book.